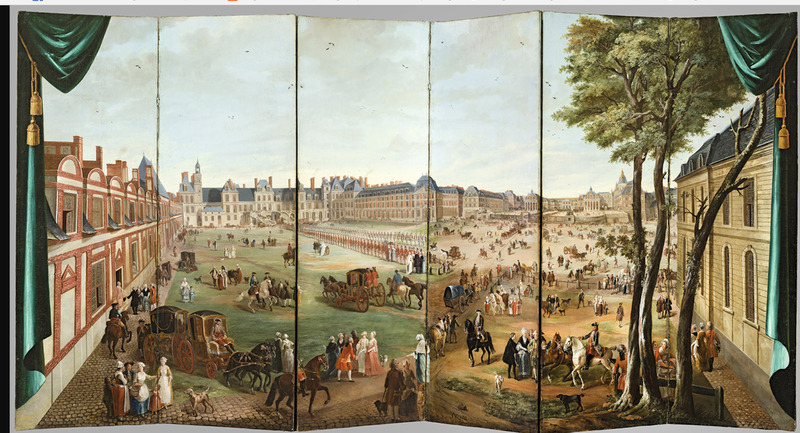 “Visitors to Versailles (1682-1789)” is an exhibition currently at the Metropolitan Museum where it will be until July 29. I was not sure whether I would find it interesting since I have been lucky enough not only to visit with the public, but also have private tours behind the ropes. This show, however, takes a novel tack: it attempts to recreate the experience of visiting the palace between the dates indicated in the title, using contemporary accounts. From the time that Louis XIV (1638-1715) transformed this hunting lodge into the magnificent palace it is still today, it has been a remarkably public place, visited by the hoi polloi as well as aristocrats and diplomats. When you walk into the exhibition they give you earphones with what they call “3-D audio” so that when you are in the pertinent sections of the show, in addition to readings from 18th century reports, there is background chatter, so you feel that it is as crowded as it was in the 18th century and is often today. More evocative than some of the paintings is a folding screen which immerses you in the Chateau and all the people that were visiting on a specific day. It is by Charles Cozette (French, 1713–1797) and from the collection of Monsieur and Madame Dominique Mégret, Paris. Photo by F. Doury. I must admit that I cannot read labels, look at art and listen, all at the same time. For me the audio was distracting. My wife, however, who is a historian and seems to be able to do three things at once, liked it. She particularly liked the fact that while the speakers were obviously actors they were quoting what was actually said at the time. Since the show was seen by our son as well, he suggested that they tell you to read the label introducing each section before you listen to the commentary; that would have solved part of my problem! I might also recommend going through the show without the audio first and then going back with the audio. My wife, however, recommends going through with the earphones first and then going back and looking at the works of art that particularly interest you. Whatever your choice, if you are at all interested in the subject, the exhibition is worth seeing. The installation is divided thematically by room, so that you get the costumes required of visitors, the development of the palace, the grounds, visits by foreign ambassadors, etc. Decorative arts such as furniture, royal carpets, porcelain are featured and explained as to their significance with paintings or prints and drawings serving as context. Here is one of the most impressive room installations. In the category of American visitors is, of course, Thomas Jefferson who took Benjamin Franklin’s place as Minister to France. Today he would be called Ambassador. 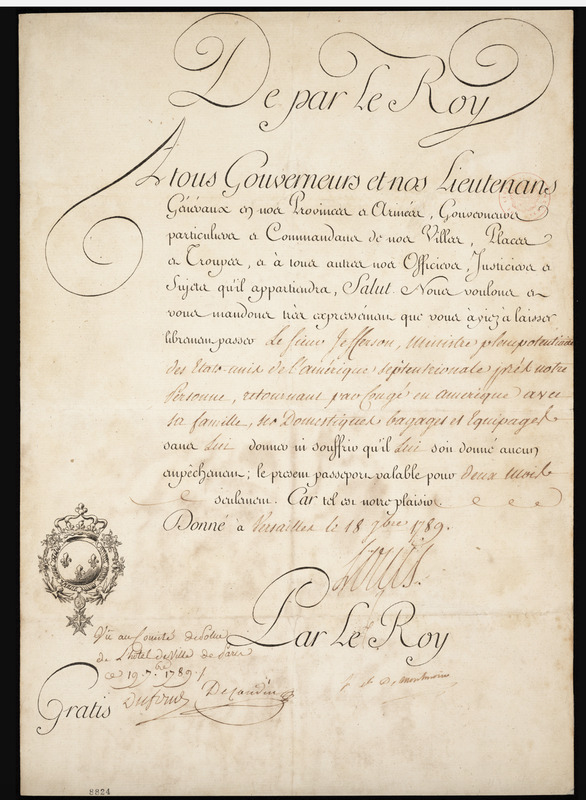 A few days before the French Revolution began in 1789 he received a passport from Louis XVI so that he could leave the country and come back to the States. 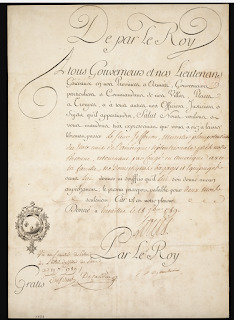 His passport is in the exhibition lent by the Library of Congress. For the most part this is a cultural history exhibition rather than one of great art treasures. 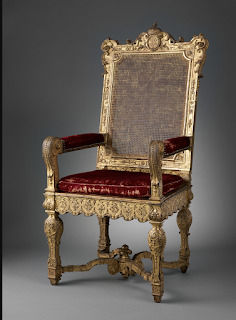 There are, however, some wonderful pieces, for instance, this gilded armchair that has long been part of the Metropolitan’s own collection, given by J. P. Morgan in 1917. 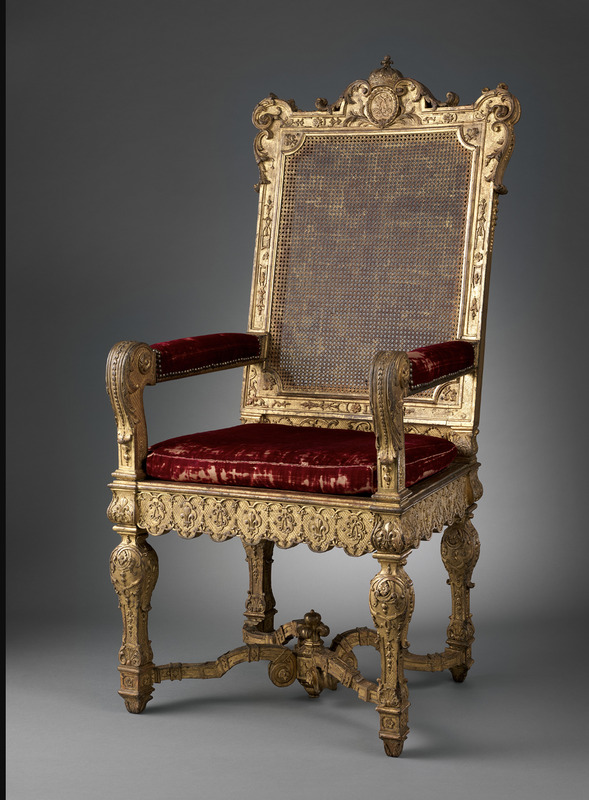 It has been recently identified in an inventory as one used by Louis XIV at Versailles for formal occasions. The photo is by Anna-Marie Kellen. My last illustration is an object that will not hit you over the head, but if you are on the lookout for it and you will find it worthwhile. It is a pietra dura mosaic top for a table from Versailles, here placed on the floor at a tilt for better viewing. 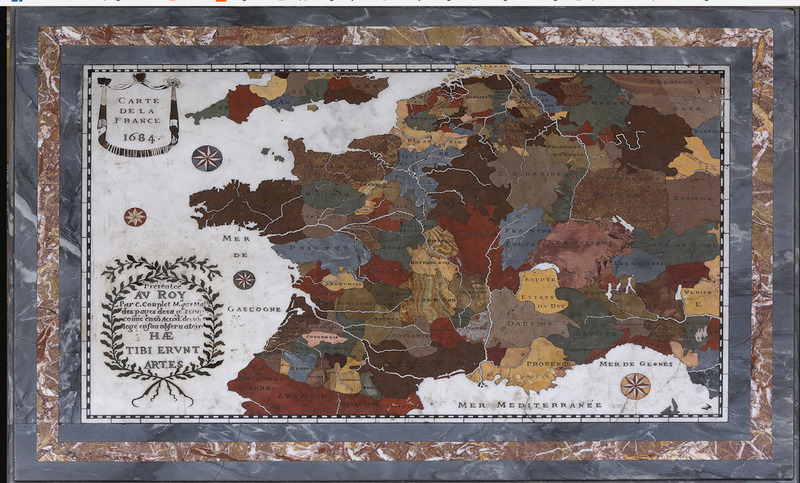 It brings together the arts and sciences with variously colored stones mapping the regions of France. It was presented to Louis XIV in 1684 probably created at the royal art factory of the Gobelins in Paris. 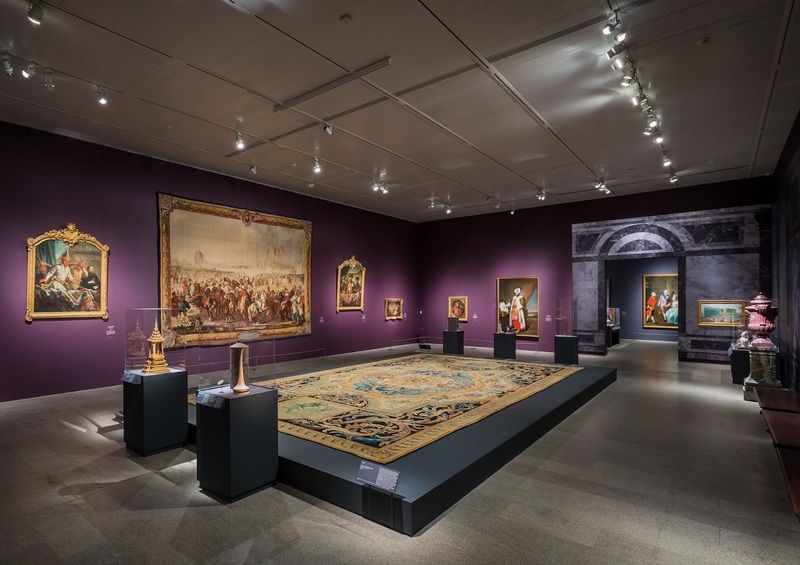 Curators for the show are Daniëlle Kisluk-Grosheide, the Henry R. Kravis Curator in the Department of European Sculpture and Decorative Arts at The Met, and Bertrand Rondot, Senior Curator at the Palace of Versailles. Though there were over 50 lenders, mostly institutional, one thing that struck me is how much was from Versailles itself. There is a large and sumptuous catalog that comes along with the exhibition. How much do you know about what 98 out of 100 or 98% of your targeted visitors are doing ? If the answer is a big fat zero, you're throwing money down the drain and missing a golden opportunity to learn from every targeted visitor not just 2% of them.